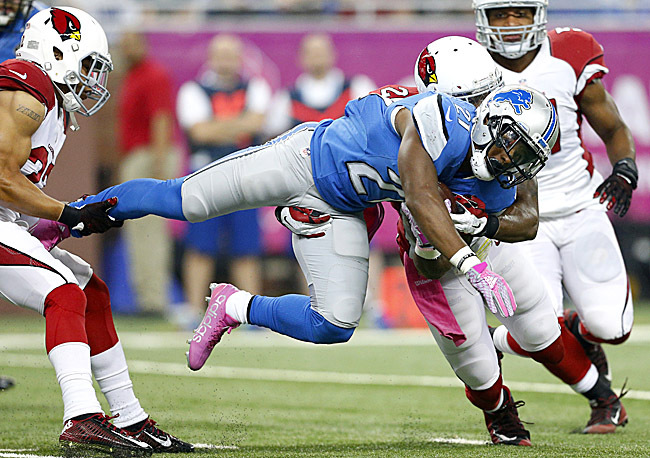 Matthew Stafford benched during loss to Arizona Cardinals. Each year there is at least one NFL team who surprises everyone by falling flat on its face. The Lions are this year’s example, though to stay they’ve fallen would imply that they actually got going in the first place. Nothing is sadder than a team with high expectations becoming the league’s laughing stock before Halloween, especially when its home fans recognize the disaster immediately. This is where the Lions found themselves on Sunday while hosting the Cardinals. Detroit came in with an 0-4 record. But they were also just six days removed from a 13-9 loss at Seattle, a game they might have won if not for a late Calvin Johnson fumble at the goal line. On Sunday, on the third play from scrimmage, facing a third-and-2 and after burning a timeout, Matthew Stafford was flushed left and threw a wounded duck off his back foot that was intercepted. The offense meandered to the Ford Field sideline under a chorus of boos. Those boos intensified on the next series when, after moving into Cardinals territory, Ameer Abdullah lost a fumble (later in the first half, the second-round rookie nearly lost another fumble on a kick return and was benched for Zach Zenner, an undrafted rookie from South Dakota State). The boos climaxed somewhere between Golden Tate’s second-quarter fumble and the Cardinals ensuing touchdown three plays later, which put the visitors up 28-7. On their first drive of the second half Matthew Stafford threw another interception, his third of the day; five plays later the Cardinals stretched the advantage to 35-7. By then, the boos were replaced by the silence of defeat. Stafford was benched. If not for the fact that his replacement was Dan Orlovsky, who epitomizes a fringe backup the way John Wayne epitomizes a rugged cowboy—there’d probably be a quarterback controversy in the Motor City. But Lions head coach Jim Caldwell does not exactly strike one as the impulsive kind, which is why the quarterback change was more like waving a white flag than shaking things up. Besides, Caldwell knows quarterbacking. He could see that two of the three interceptions weren’t Stafford’s fault. The second was just a great diagnosis of a screen pass by defensive lineman Cory Redding; the third was on Calvin Johnson, who failed to convert his route into the back-shoulder pattern that Patrick Peterson’s press positioning demanded. • THE PLAYBOOK SHUFFLE: Detroit's Tim Wright has played under five offensive coordinators for three teams in his three NFL seasons. Here's why the talented tight end has moved around so often and how he's handled the varied vernacular. Johnson, like Tate and tight end Eric Ebron (who sat out this game with a knee injury) has underachieved this season in a variety of ways. In fact, none of Detroit’s skill players are performing well. Naturally, the discombobulation gets manifested in Stafford’s performance, which has also been uneven. Stafford’s wild stallion tendencies are a double-edged sword, and this season the sharp edge of inaccuracy has stabbed the Lions. There are also times when Stafford has not read the field with clarity. Half of NFL quarterbacking is being able to quickly eliminate what’s not open. Stafford isn’t always great here, and the more he struggles the more his erraticism takes over. That’s when you see him firing fastballs into traffic. Rookie Ameer Abdullah, yet another skill position player selected high in the draft by Detroit, continued to disappoint against the Cardinals. But it’s not entirely fair to expect Stafford to play with clarity right now. Anyone who has watched even one Lions game (and one game is enough, because all five have been the same in this regard) knows this team can’t run the ball. They try, they just can’t. Pass protection has been iffy as well. The common thread here, of course, is the offensive line. It has been constant flux at left guard, where first-round rookie Laken Tomlinson is the favorite but shows all the symptoms of a guy who’s not quite ready. The right side of the line, regardless of the personnel combination (which has also been interchangeable) sorely lacks athleticism. That’s made it difficult to pick up stunts and blitzes in pass-blocking. It has also left the Lions with no semblance of a perimeter rushing attack and, not to be overlooked, has crippled the backfield screen game, which is a major component of offensive coordinator Joe Lombardi’s system. • DETROIT’S DRAFT PROBLEM: The Lions have had the NFL’s worst running game in 2015. It’s even worst when you consider the unmatched draft investment they’ve made in running backs. Hamstrung by those inadequacies up front, Lombardi’s play-calling has at times lacked continuity. How could it not? Naturally, the second-year coordinator has been under siege for concocting predictable gameplans, but that would happen to any coach whose men can’t run, pass protect or even get outside to block on the more gimmicky plays meant to manufacture cheap yards. Exacerbating matters is that Lombardi’s scheme is built around these things. We think because he worked under Sean Payton in New Orleans, and because he has a rubber-armed young quarterback plus a freakish 6-5, 235-pound wide receiver, Lombardi must want to stretch the field. But understand, stemming from his lessons in New Orleans, Lombardi’s first priority is protecting his passer. With the Saints, that meant a lot of double-team chip blocks to help offensive tackles and create a soft form of seven-man protection. Detroit has done this, as well, though with Stafford lacking Drew Brees’s discipline, Lombardi has also emphasized more three-step timing in order to get the ball out quickly. Three-step timing minimizes the deficiencies of an offensive line. But if you can’t run, you’re going to find yourself in long yardage situations, where most three-step concepts don’t afford the necessary time for pushing the ball downfield. Last season, Lombardi was lauded for revamping this offense and helping take the Lions to the playoffs for only the second time in 15 years. In the seven months since then, he didn’t forget how to coach. He’s just been dealt a different hand (one with much worse cards). Like the rest of his club, he hasn’t figured out how to overcome it. This is also true with defensive coordinator Teryl Austin, who was on every head coaching short list following last season. Austin’s 2014 group, which ranked second in total defense, was built around the front seven. Three of that front seven’s four best players—defensive tackles Ndamukong Suh, Nick Fairley and linebacker DeAndre Levy—have not been around this season. (Suh and Fairley left in free agency; Levy has battled a hip injury, which he just re-aggravated in his season debut against the Cardinals.) The lone remaining stud up front, defensive end Ziggy Ansah, has flashed but not shined. • Q&A WITH DEANDRE LEVY: In August, Jenny Vrentas talked football with the budding star linebacker. Along with football, he’s an Instagram must-follow who’s well on his way to being a gluttonous vagabond. A dominant front seven had masked a ho-hum Lions secondary. Darius Slay is a fine corner, but not a No. 1. Rashean Mathis has been a zone-based defender his entire career; some in the organization were skeptical that he could thrive in the matchup and man concepts that Austin’s scheme demands for a second straight year and at age 35. In the slot, Josh Wilson on his best day is good-not-great, while safety James Ihedigbo glistens as a line of scrimmage attacker but becomes increasingly vulnerable the further back he plays. On the other hand, maybe the 2015 Lions aren’t a disappointing aberration; maybe the 2014 Lions were just a pleasant surprise. Last season, four of Detroit’s 11 wins came in contests decided by four points or less. In all four, Stafford led a late fourth-quarter go-ahead drive. Granted, close wins can be as admirable as blowout wins in the NFL. But how about close losses vs. blowout losses? Ask the 2015 Lions—over the last seven days, they’ve experienced one of each.